In March, a total of 841,191 Canadians used food banks, according to a report published Food Banks Canada, which described the number as “dismaying”, given that the country is supposed to be one of the richest in the world. The number of people using food banks increased by 1% compared to 2013, and remains 25% higher than in 2008, just before the global financial crisis hit. Twenty-five percent higher means that 170,000 more Canadians walk into a food bank every month than in 2008. Over one third of people receiving help from food banks are children. Forty-three percent of recipients are single unattached individuals, most of them living alone, compared to 30% in 2001. One sixth of all households receiving help from food banks have income from current or previous employment. 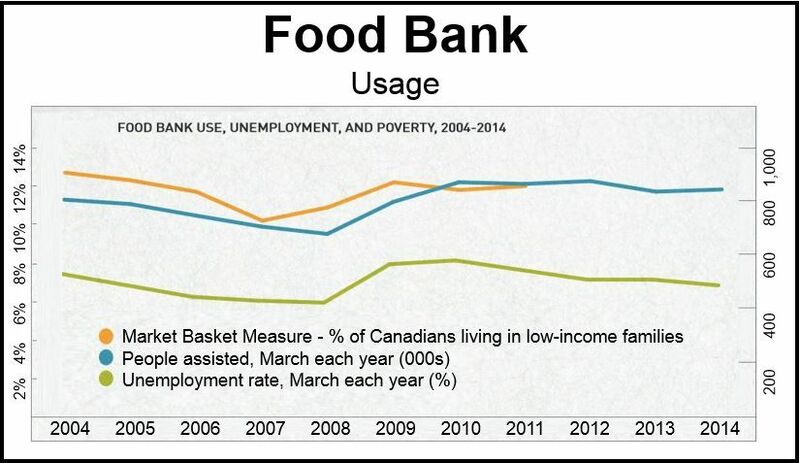 According to Food Banks Canada, food banks would not need to exist if there were no poverty in the country. Hundreds of thousands of people across the nation each year face a sudden, major loss of income and find it impossible to get the required help to offset it. When people fall on hard times it can be extremely hard to climb back up, the association says. This is especially true for those struggling with long-term physical or mental health problems, disabilities, as well as immigrants and indigenous people. In its report – HungerCount 2014 – the authors say rising poverty is mainly due to the huge loss of well-paying blue collar jobs, too many workers with no skills for the labor market’s current requirements, and inadequate social programs for those who face hard times. “We have largely not taken the steps necessary to address these problems head-on,” they wrote. Housing: there is an urgent need for an adequate supply of affordable housing. Investments should be made at the federal level. Food insecurity: in the North of the country there are extremely high levels of food insecurity. This problem needs to be addressed. Basic income: the currently ineffective and much-stigmatized social assistance bureaucracy at provincial level should be replaced with a basic income administered through the tax system. Families with children: the current “alphabet soup” of federal child benefits, awash with such acronyms as UCCB, CCTB, etc. should be replaced with a strengthened Child Well-Being Benefit. Training: unskilled-workers should be helped so that they may upgrade their skills for the jobs of today. For the past fifteen years, the number of Canadians coming into food banks for help has remained stubbornly above 700,000 every month.